What’s your favorite summer memory? One of mine is sitting around munching on summer fruit at the beach or by the pool. I love cold fruit on a hot day. Summertime brings about some of the best fruit of the year; cherries, berries, mango, grapes, kiwi, and peaches. 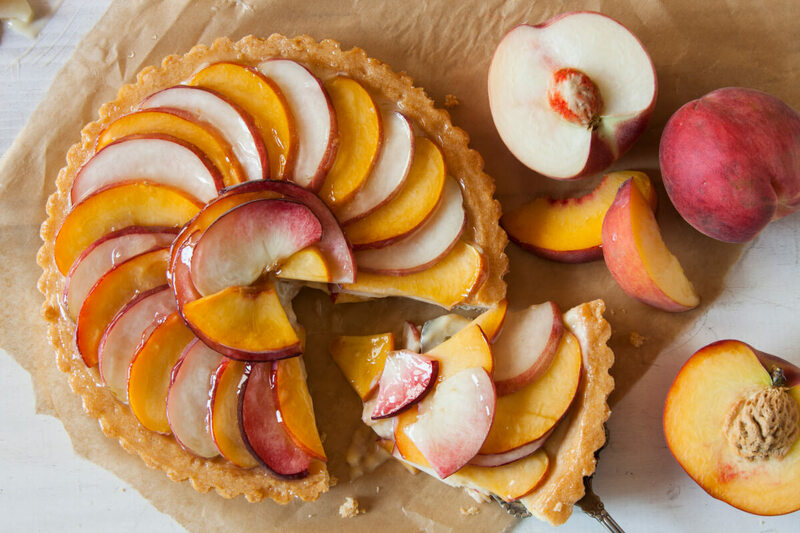 Of all the fruits available this season, peaches have to be one of the sweetest fruity treats. The range of flavor from tart to sweet with the varying colors never ceases to amaze me. Is there a more perfect fruit to represent summer? We have 4” and 8” seasonal fruit tarts available all year long, but this summer we are stoked to bring you our 8” Fresh Peach Tart that’s made with the sweetness of both yellow and white peaches layered in a beautiful design you will be proud to serve. We take a vanilla cream filled buttery tart shell and top it with alternating super sweet white and yellow peach slices. We then use a light glaze to help keep the peaches from turning. The tart is gorgeous and will decorate any table it’s placed upon. Your guests will be chomping at the bit to get a taste. This tart won’t be around for long, so visit us at the Bakery today to pick up your tart or to place your order. While you are there don’t forget to grab a few baguettes or rolls to complete your meal.